Behold the spokeswoman for Minnesota’s minority community. 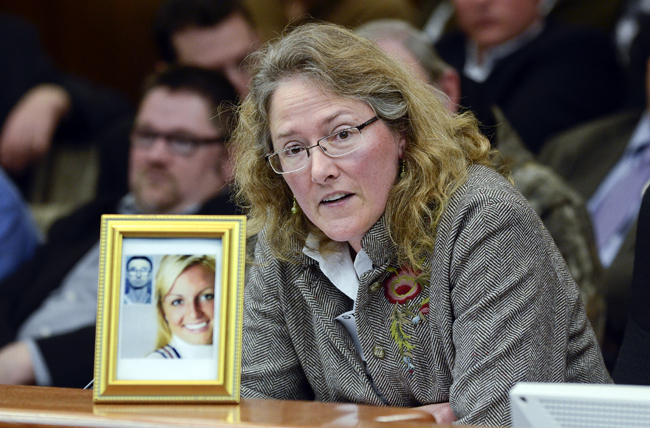 Voice of Minnesota “minorities”, Heather Martens, exploiting a dead woman to no avail back in 2013. It’s Heather Martens, longtime “executive director” and, for most of the decade, pretty much sole “member” of “Protect” Minnesota, a criminal-safety group famous for its comic ineptitude. She left “Protect” Minnesota a while ago; word has it that MIchael Bloomberg realized that he’d be throwing even more money away if he was filtering it through her; Minnesota’s Criminal Safety movement is essentially run from New York today (the Reverend Nancy Nord Bence notwithstanding). Given that she isn’t formally involved in the Criminal Safety movement anymore, I’m not sure why the Strib is giving her free space to recite her chanting points. But give her space, they did, last Friday. The op-ed was titled “Story on ‘gun rush’ by minorities lacked evidence”. And I’ll had Martens this much; she’s an expert at “lack of evidence”; she makes Jesse Ventura look like Alan Dershowitz. I was disappointed in the Star Tribune’s article “New fear bolsters gun rush in state” (Jan. 1), which amounted to a grossly misleading advertisement for the gun industry. One suspects Heather would recoil in horror at the notion of registering Muslims for any other reason – but she wouldn’t mind making the rest of us walk around with yellow “gun” shapes sewed to our shirts. The only evidence of a “rush” on guns by Somalis and other minorities is the word of gun lobbyist Andrew Rothman and the existence of one minority gun group. Well, yeah – and a lot of anecdotal evidence from an awful lot of other people, minority and gay and liberal. Perhaps Ms. Martens believes NBC and the BBC are also emissaries of the “Gun Lobby”. There may or may not have been any such rush on guns. Which may or may not undercut the entire stated point of this op-ed. You’ve got to hand it to Rothman, however. He scored, with no proof, a front-page story normalizing gun carrying for a market the gun lobby has been unsuccessfully pursuing for years. And since Ms. Martens is putatively concerned about “evidence”, we’ll await her proof that the surge, if any (heh heh), is in any way related to “gun lobby” marketing efforts, rather than minorities, gays and liberals discovering what Second Amendment supporters of all races (including Dr. Martin Luther King) have always known. Now for the reality. Gallup’s research shows that American household gun ownership reached a near-historic low of 37 percent in 2014, compared with 57 percent in 1977. According to the General Social Survey, overall household gun ownership has dropped fairly steadily for decades (though a small number of people continue to increase their already large collections, keeping the gun industry profitable). And, as pointed out in this space, the Gallup Poll was a fairly risible effort – a telephone poll of a “minority” in this country, before the last election, when gun owners were legitimately reticent about talking. Thin evidence? Perhaps – but then, given Gallup’s performance in the last presidential election, not as bad as I might have once admitted. Speaking of thin evience, it’s the point of the article where Ms. Martens drops a series of unsupported-to-fictional statements in hopes of gulling the gullible – a practice I call “Heathering”. There are many reasons most Americans, including minorities, aren’t behaving the way the gun lobby wants. So while neither Martens nor (for sake of argument) Rothman “has any evidence”, Martens states this as a conclusive fact? First, bringing a gun into the home puts the family at greater risk of injury or death. The Annals of Internal Medicine reported in a 2014 meta-analysis that a gun in the home doubles the risk of homicide and triples the risk of suicide. Unsecured guns also pose a lethal threat to young children. And without context, that sounds pretty bad, doesn’t it? Of course, the study doesn’t control for who it is doing the shooting; is the gun “in the house” of a felon? A gang member? As usual, Martens seems to think that simple hardware corrupts people. The push to market guns to people of color is particularly ironic in light of the gun industry’s history of championing an extreme white supremacist agenda. As has been noted in the past, this is a complete fiction. The National Rifle Association armed Martin Luther King’s bodyguards, and allowed them to train at their range in Virginia – one of very very few integrated facilities in the DC area in 1960. OK! Strap yourselves in! She’s going for the big claim here! Here comes the “Evidence” she was talking about! Here’s where she’s going to deliver on her claims! ….like board member Ted Nugent. An over the hill rocker and loose rhetorical cannon who’s said some deeply stupid things. Feel free to pony up the evidence, Heather. You’re verging on defamation, here. Still – her claim about Nugent – devoid of fact as it is – is about as close as she’ll get to a fact in the rest of her wrticle. In 2003, when [shall-issue carry] was being debated here in Minnesota, proponents dismissed all predictions of political intimidation with guns. But such intimidation is now commonplace. Men (it is almost entirely men) now openly carry loaded weapons to legislative hearings about guns at the State Capitol and to other government meetings and political events. Surely there were complaints filed, police called, a paper trail created? No. There was not. What happened was a group of people, following the law to the letter, did something they were legally entitled to do. The Capitol Police say, openly, that the carriers were among the most diligently law-abiding people in the building. Ms. Martens – feeling “intimidated” by law-abiding people doing things that are perfectly legal is your prerogative. Whining about it puts you on par with people who don’t like being in rooms with black people. A gun-toting group took over a national wildlife refuge in Oregon, with no legal consequences. …and an acquittal. That, Ms. Martens, is a legal consquence. Following a shooting last year in Minneapolis at a demonstration led by people of color, one man whom a prosecutor identified as a “white supremacist” is soon to be tried on charges of shooting and wounding peaceful demonstrators. Well, wait, Ms. Martens – there’s going to be a trial. At issue was whether the protesters were peaceful, or in fact a legitimate threat of death or great bodily harm, potentially leading to a self-defense claim. Until then, the suspect is innocent until proven guilty. Now, this blog has made great sport of pointing out, debunking, and roundly mocking Ms. Martens’ endless parade of lies – all the while scampering away from any engagement from those who know better. And it’s all been good clean political fun, as these things go, so far. But next, Martens slides over the edge, from being a befuddled ninny to complete moral depravity. Gun carry laws don’t go far enough for those who want to return to the “good old days” when it was easier for white men to kill black men with impunity. We carry guns because we want to kill black people? Wow. And Martens thought Rothman made a claim with no evidence. It seems I’ve been giving Martens too much credit all these years; where I used to think she was just a gabbling ninny, it seems she’s really something much, much less innocent. That’s why the gun lobby invented “Stand Your Ground” or “Shoot First” laws, which allow a person to shoot and kill, in public, anyone they deem threatening — and people of color are well aware who that means. Well, no – that’s not how “stand your ground” works. But “people of color” are aware of what the law means; they use “Stand Your Ground” in self-defense cases twice as much per capita as white shooters. In Heather Martens’ weird little world, where black people are nothing but hapless victims, I’m sure that comes as a shock. So let’s recap: in a column where Heather Martens accuses Andrew Rothman of presenting no evidence to support his claim, she presents…at best no evidence to support any claim, and at worst, evidence that debunks her and, finally, marks her as a fairly toxic little person. Dear Minnesota Minorities: you might want to specifically terminate Ms. Martens as your official spokesperson. This entry was posted in Big Gun Control, Victim Disarmament and tagged Rev. Nancy Nord Bence by Mitch Berg. Bookmark the permalink. The only solution Ms. Martens sees is an outright ban on gun ownership by religious and ethnic minorities in Minnesota. It would be the progressive thing to do. Only a reactionary white supremacist could oppose this. She is obviously trying to get her hand into Bloomberg’s pocket by showing her enthusiastic willingness to be the crazy cat lady of the gun grabber mob. Everyone loves to read stories about the crazy cat lady, not because what she says is important or enlightening in any way, we love the crazy cat lady because she’s crazy; you never know what she”ll say or do, but you know it will be funny. Looking forward to Rothman’s rebuttal. Although I should be surprised at the lack of journalistic integrity by the editorial editors at the Red Star, I am not. In fact, I don’t think that fish wrapper has had any integrity since 1960. Wish I’d said it – There already is a word for womansplaining . It’s called bitching. Whenever Mitch makes references to “ELCA hair,” I immediately picture Martens’ scraggly coif. So, does this mean that the death of the member of that group who got shot by FBI agents… was an illegal consequence? Man, that’s a good old-fashioned fisking. Very impressive! Per Featherblade and our gracious host and others, one would have guessed that at some point, members of the “journalistic” profession might have “read the papers” and “known some facts” that might have contradicted Ms. Martens’ claims. Really one of my biggest complaints dating back to the Clinton years. Old Bill would say some complete….nonsense….that would get flagged in about 13 micro-seconds if it were a Republican talking, and the press would just eat it up.